Growing up in Michigan I had seen very faint northern lights, mostly in the winter. The lights I saw were white in color and seemed like weak heat lightning. Not too impressive other than being the glow of the northern lights. 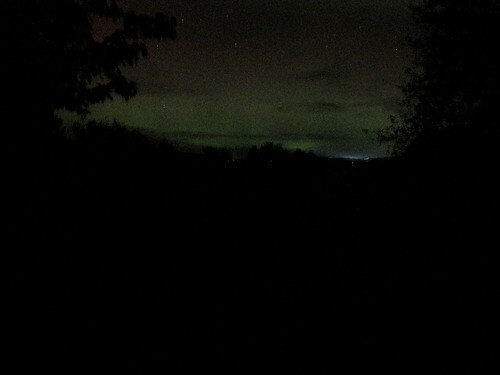 Tuesday, just when full darkness hit the real northern lights came out for about twenty minutes. Initially, we thought the lights were from the town of Bellaire but I noticed that they were moving and one part of the lights towered up into the sky almost to 45 degrees above the horizon. The lights were also slightly green. Northern lights! I took a picture which you can see below. Nothing like the dramatic pictures of the lights you can find elsewhere but you can see the green tint and that's good enough for me. You can see the lights of Bellaire in the picture. They are the white glow in the bottom right corner of the northern lights.